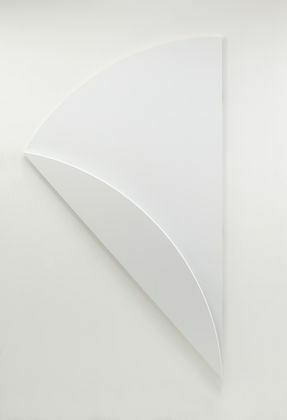 Two white, shaped-canvas panels joined and hanging on the wall – which one is the background? Maybe the wall is the background. Don’t ask questions. Just look and feel the space pulsate in front of you, background and foreground alternating, curves moving… that’s what Ellsworth Kelly (American, b. 1923) wants you to do: “And I feel that in my own work, the space between the viewer and the painting is the area that I want to enliven.” Your eyes are trapped in that consistent flat, white tone with no place to go but to notice the edges. “Edges happen when the form becomes as quiet as it can be”, he says. It’s as if his shapes are the result of natural growth, like a leaf. Minimalist? Hard edge? Pop? Abstract? None of the above and all of the above – but that his art is about abstraction is the one thing that Kelly admits to. He says: When you look with your mind turned off, everything becomes abstract. Kelly’s art, quiet and calm, with clear and simple color panels, straight or curve-edged, is no doubt a far cry from Jackson Pollock’s frenzied abstract expressionist drip-and-splash paintings. (Pollock’s influence is more from Miró and the Surrealist unconscious). Abstract art is something you cannot name because it does not represent anything specific in the world, like an apple or a window. But in Kelly’s case, it comes from things he sees in the world around him, a flower, an oak leaf, shadows made when the sun strikes a simple set of open stairs, or reflection in the Seine of an old arched-bridge in Paris… Even now into his nineties, he still sketches every day, as he has done all his life. He tells of where his art comes from: “Everywhere I looked, everything I saw became something to be made, and it had to be made exactly as it was, with nothing added…” – but things can be subtracted. His curves often come from a segment of a line from a sketch (a flower or leaf, for example), he then fills the shape with color on the canvas until “it looks as quiet as can be”. He not only still hand paints every canvas, he even primes them himself because “it’s just not the same” when an assistant does it. Rightly so. His art is after all about perception, about impressions on his retina that he wants to retain, without emotional or other conscious interpretation. In this sense, Kelly could be called the true heir to Monet’s impressionist art, particularly the late ones that Monet (1840-1926) himself did not like. Monet probably arrived at his abstraction by accident of his cataracts and general age-related decline of eyesight, as evidenced by his own rejection of his late works, many of which had been saved by family members from his own destruction. I have written here about a scientific study of Monet’s cataracts’ effect on his late style which is heavy and thick in color and stroke. Now we can see for ourselves how Kelly had been inspired by Monet’s late work in Monet / Kelly (11/23/2014 – 2/15/2015) at the Clark Institute in Williamstown, Massachusetts, a precious small museum set in the Berkshires – and as ‘New Englandly’ * as it comes. Kelly personally selected the works in this exhibition, showing his affinity to Monet not by surface resemblance of their art but by inspiration and process: the landscape and its perception. Over the years, Kelly returned many times to Belle Île and sketched the scenes on the French coast that Monet had painted early in his career. This show pairs them: Kelly’s sketches with Monet’s paintings. In these masterful sketches (from a less assured beginning in 1949), one can see the bones of Monet’s shimmering impressionistic seascapes of rocks and water. See here the rocks at Port Goulphar, Belle Île (1887) by Monet, together with Kelly’s sketch (2005). And thus, rather than a dramatic declaration, this is Kelly’s way of acknowledging his indebtedness to Monet, almost 70 years after his first visit to Belle Île. This lack of the sense of self-importance is just one more way that sets Kelly apart from his contemporaries, the Minimalists, Abstract Expressionists etc. Also, by showing with concrete proof from the actual works, it is scientific, not rhetoric. And we can judge for ourselves. * The poet Emily Dickinson (Massachusetts, USA 1830–1886) wrote that “I see New Englandly“, alert to the drama of the weather and all things around her in her native landscape. ** Kelly’s visit had very likely been the result of having read Surrealist artist André Masson’s 1952 essay in the French journal Verve calling Monet’s Grande Décorations (1912-1924, in the Tuileries by the Louvre) the “Sistine Chapel of Impressionism”. *** The current in New York in the 1950s was instigated by artists such as Barnett Newman, claiming his art and that of his Color Field contemporaries such as Mark Rothko, were heir to Monet’s late abstraction. And some even claimed Pollock’s Abstract Expressionist work was from Monet. All apparently a conscious attempt to claim legitimacy for the New York School of American art.